Often excluded and overlooked at the national level, poor and marginalized communities within low- and middle-income countries also frequently slip through international efforts to raise global education outcomes. When the focus is on average country-level performance, those who face the most barriers to education and learning continue to be left out. 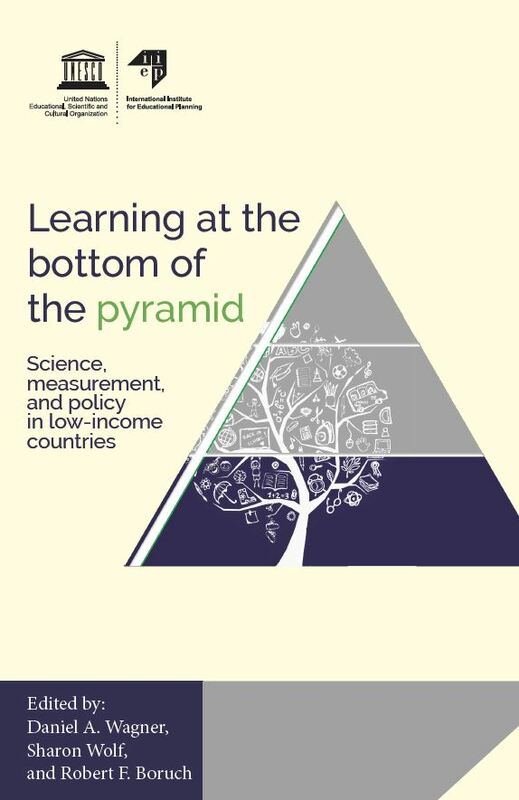 A new edited volume, Learning at the bottom of the pyramid: Science, measurement, and policy in low-income countries, published by the UNESCO International Institute for Educational Planning, shifts the conversation to bring more attention to learning inequalities within countries. The book is rooted in discussions on learning that first took place during an international conference held by the University of Pennsylvania, in the United States, on 2-3 March 2017. The premise is that by focusing more on marginalized communities within poorer countries equity can be improved and overall national levels of learning will increase. Quality education and learning play central roles in the 2030 UN Sustainable Development Goals (SDGs). However, the development goals are largely normative, meaning that too little attention has been given to variations within countries and to those who are performing at the lower end of the social pyramid. Dan Wagner, UNESCO Chair and senior organizer of the conference, has called for greater attention to the “learning equity” agenda as a way of reinforcing the potential and impact of the UN goals. Featuring essays and commentaries from 36 international experts, the book is a cutting-edge resource for those seeking to understand the science of learning in low-resource settings worldwide. It explores the complex nuances of the phrase bottom of the pyramid, looks at how to measure learning in marginalized populations, and ways that new policy approaches can improve learning for all. Greater knowledge on learning in low-income societies is crucial if we are to achieve both inclusion and equity in improving the quality of education worldwide. Daniel A Wagner is UNESCO Chair in Learning and Literacy, and Professor of Education at the University of Pennsylvania. He is Founding Director of the International Literacy Institute and Director of Penn's International Educational Development Program. His most recent book is Learning as Development: Rethinking International Education in a Changing World, published by Routledge (2018). Sharon Wolf is an Assistant Professor of Human Development in the Graduate School of Education at the University of Pennsylvania and a Jacobs Foundation Research Fellow. Robert F Boruch, University Trustee Chair Professor at the University of Pennsylvania, is a Fellow of the American Academy of Arts and Sciences, the American Statistical Association, the American Educational Research Association, and the Academy for Experimental Criminology. School grant policies: technical guidelines now out! IIEP at the 11th Convergences World Forum “Make Society, Make Tomorrow”!